Jussi Veikkanen (born 29 March 1981) is a Finnish road racing cyclist, with the FDJ team. Born in Riihimäki, Veikkanen started his career with team Mälarenergi and he became a professional cyclist in 2005 with Française des Jeux. He has won the Finnish national road race title seven times between 2003 and 2014. After a long breakaway on stage 2 of the 2009 Tour de France he donned the Polka Dot Jersey for king of the mountains. 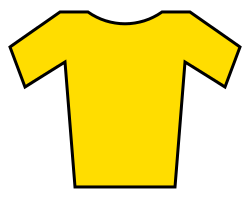 He kept the jersey until stage 6, when Stéphane Augé took it. He signed with Omega Pharma–Lotto for the 2011 season, but rejoined FDJ–BigMat for the 2012 season. Veikkanen announced ahead of the 2015 edition of the Tour de Vendée that the race would be his last as a professional, and that he would remain with FDJ as a member of staff after retiring from the road. ↑ "Jussi Veikkanen". Cycling Archives. Retrieved 5 May 2014. ↑ "BigMat joins FDJ as co-sponsor in 2012". Cycling News. Future Publishing Limited. 24 November 2011. Retrieved 2 January 2012. ↑ "News shorts: Zandio to retire at end of 2016, Veikkenan announces retirement". cyclingnews.com. 29 September 2015. Retrieved 29 September 2015. Wikimedia Commons has media related to Jussi Veikkanen.